Back to Basics by Christina Aguilera. Songbook for Piano-Vocal-Guitar. 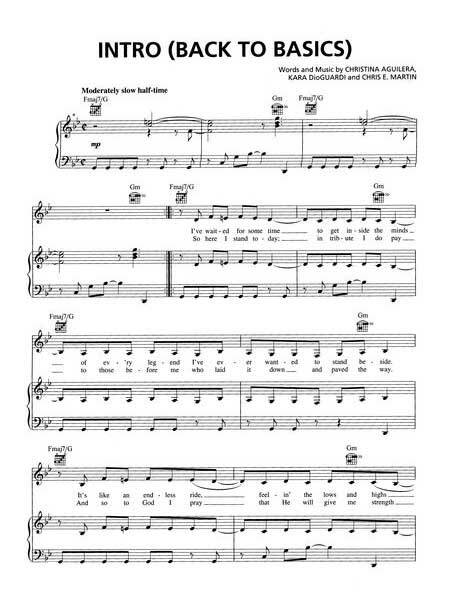 Vocal melody, lyrics, piano accompaniment, chord names and guitar chord diagrams. 160 pages. PDF. Back to Basics is the fifth studio album by Christina Aguilera. Inspired by her 1920s–1940s idols as Billie Holiday, Otis Redding, Etta James, and Ella Fitzgerald, Aguilera sought to bring old-school jazz, blues and soul inspirations with a modernized style into Back to Basics. Lyrically, the album is inspired by real-life events Aguilera had experienced, including her marriage with Jordan Bratman in 2005. Aguilera promoted the album by performing at concerts from mid-2006 to early-2007. The album’s supporting tour Back to Basics Tour, which visited countries in North America, Asia, Europe, Australia and Middle East. Back to Basics received positive reviews from music critics. The record received a Grammy Award nomination for Best Pop Vocal Album, and its lead single “Ain’t No Other Man” won Best Female Pop Vocal Performance at the 49th Annual Grammy Awards in 2007. In its first week of release, the album debuted atop the US Billboard 200 chart with first-week sales of 346,000 copies. Back to Basics achieved similar success internationally, reaching the top spot in over fifteen countries including Australia, Canada, Germany, Ireland, Switzerland and United Kingdom. The album has sold 1.7 million copies in the US, and 4.5 million units worldwide. This song book rocks! I got it for my birthday, and it has every single song from the album- just absolutely fabulous. And it is a REALLY thick songbook (considering it was a two disc album), so it’s like having two books bound into one. This record stands the test of time, with a mixture of old and new. So wonderful to have the sheet music so I can play along!